Last week I was pulled into the beautiful book My Life in France by Julia Child. It was so much more than I expected, and I fell in love with her story, her writing, her determination, and her foods. When I was in high school, I took 4 years of French, and in college I followed it up with another 4 semesters of the language. And yet not only have I never been to France, but I've never even been to a French restaurant. It's just too expensive for either to be practical. So I decided to try my hand at French cooking at home. Thrilled with the idea of the daunting task of French cooking, I perused recipes on the internet. 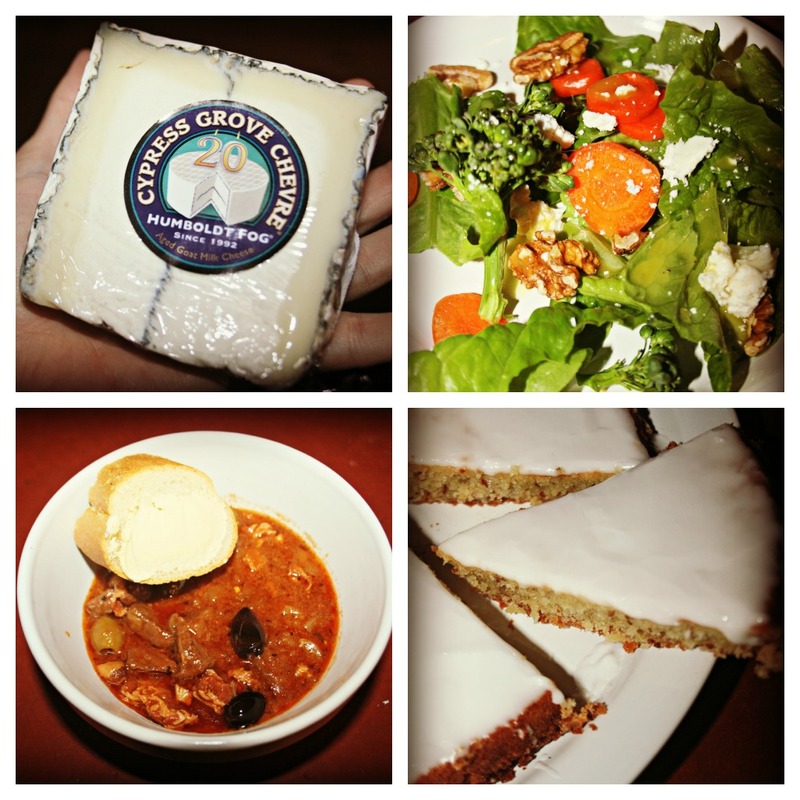 I finally decided on a menu of salade verde with Humboldt Fog (aged goat cheese) and walnuts in a lemon vinaigrette, estouffade provencale, a slow cooking beef stew with slices of French baguette on the side, and gateau nantais which is a rum cake from the Northwestern region of France. All of the ingredients I had on hand except for the cheese, the baguette, the nicoise olives and fennel that go in the stew, and the rum. The salad greens and veggies were even fresh from my fall garden! So overall it wasn't too costly to prepare the meal - definitely much cheaper than a French restaurant. Maybe one day I'll get to eat at one, or even get to travel to France, but for one evening, it was fun to pretend. The foods took time to prepare, but were divine in their assortment of flavors. It was fun to put on French music, drink wine, and enjoy several courses at dinner. The food was so rich that I was stuffed for hours afterwards, even though I had small servings. Oh Lisa that looks delicious and I can imagine how wonderful it was to create and enjoy.Julia Child I have always wanted to read that. What a wonderful meal! I bet your husband loved it. Oh my, this looks and sounds delicious...when are we ready for dinner??? I make paella here at home but would love to try some really truly authentic Spanish paella! Your meal sounds such a delicious treat and with the music and wine created the perfect atmosphere for a wonderful night in. Bravo. J'espere qui le repas etait tres bon! As for other foods I have always wanted to try, difficult one, maybe somewhere that uses goat as I have never tried that ever. Delicious! I love that movie Julie and Julia. I have never attempted french food, but it is something I would like to try! What a fun thing to do! Everything looks so fresh and delicious. I've been to Italy, but went for the art. Italian food is not my thing, but if I were to go to France, I'd go for the food! Hope you get to have the real experience one day. Your food looks delicious! I bet it was fun, and I know you were up for the challenge. I love Indian food. An Indian friend in grad school cooked a lot, and I learned to love the mix of flavors. I'd like to try my hand at cooking some. Looks really wonderful. I just got a new crepe pan the other day. How fun! What a great way to "travel" to France without the cost :) The food looks delicious! It is so much fun to experiment with different recipes. I made a caprese salad with capers, etc... it was expensive, but I felt so cosmopolitan when I was making it! I fix French fries once in awhile, nothing to it! At least you can pronounce the names of the food correctly! wow that menu sounds fancy, but you seemed to have pulled it off, yummy food in your pics! Oh yum Lisa. It looks so good. I can remember being in Florida and seeing all these Cuban restaurants. I had to try Cuban food. MMMmmmmmmmm It was especially good because I didn't have to prepare it. You are so brave to delve into her recipes. I am very impressed! I am on a Mexican food kick right now. Much like you, I took years of French and did so in college. I have never been to France! lol I have several of Julia's cookbooks and enjoy her attitude toward cooking. Your dishes look great! Good for you, Lisa, trying something new. It all looks delicious! I always like to try new cuisines and living in Chicago, there are always new restaurants and foods to try. I think our most daring was sushi and now we love it. It's our go-to food when we want to go out for a nice dinner. We have always found it hard to go out with other couples because it's hard to find people who want to try new foods and not just Italian. Blech. Boring. I don't like sauces and pasta, so I hate wasting a dinner out on that. LOL... you keep eating all that French cooking and you are going to be speaking like a French person. It all looks so good. I need to go out and eat lunch. Sounds like a lovely dinner. I have always wanted to try making some french dishes. Perhaps I will try after the New Year. I now think there is nothing you can't do!!! But the name Humboldt Fog just cracks me up, I love it!! Where do they come up with them? The boys Thanksgiving picture is just amazing!! How you got all three of them to look so cute all at the same moment is a mystery to me. It looks delicious. How adventurance your were. I loved the movie Julie and Julia, the food was so rice! We have French in common. I took it all through high school and college as well. I added Spanish into the mix when I entered college too. I loved it so much! I'm afraid I am probably back to high school level with my fluency again due to lack of practice. Poo! Anyhow, your meal looks fabulous! Wow, everything looks delicious! French food can be so rich, but it sure is scrumptious. Yummy! I love different cheeses! Cheese and chocolate are my weak points. Weak as in I eat too much of them.